Right of Way: Do You Really Know How it Works? Published on August 5, 2015 in General Interest. 0 Comments Tags: Australian Right Of Way, Right Of Way. 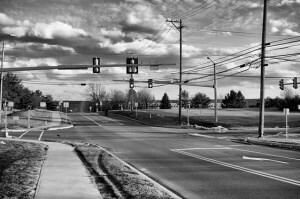 Photo Under Creative Commons License Brad K.
One of the most common causes of accidents on the roads involves errors and confusion regarding who has right of way. Despite right of way rules being tested before gaining a drivers license, collisions between licensed motorists regularly occur when two cars unwittingly intersect on the same course of travel. This makes it important for motorists to understand their responsibilities in the numerous situations where right of way rules apply. These are explained in a quick refresher course below. When do I have to give right of way? When turning left on a green light and pedestrians crossing the road. On a roundabout, vehicles must give way to any other cars already in the round about, giving way to their right. Whoever is already in the roundabout has right of way to pass before those wanting to enter the roundabout. At four-way intersections where there are two stop or give way signs where two different roads meet, drivers must give way to traffic already on the roadway. After giving way to traffic already travelling on the road, they then must give way to each other. If one car is turning across the path of another, i.e. turning right, they must give way to that vehicle. If there is a car approaching the opposite intersection at the same time, those wanting to travel straight ahead or turn left get precedence to the motorist turning right. Drivers on a road that ends at a T intersection must give way to their left and right – i.e. let all vehicles pass and wait for the road to be clear, before turning into the new road. At an intersection where two road cross each other, drivers must give way to their right. Similar to a four-way intersection, when a motorist wishes to turn right at an unmarked crossroads, any vehicle travelling in an oncoming direction has right of way. It’s important to remember that the concept of having the ‘right of way’ is one which is not granted under the law. There is however an expectation that people yield to others in accordance with the rules of the road, including indicating and slowing down, especially at intersections. Police often fine drivers who they observe making dangerous manoeuvres at intersections. If you believe you have been unfairly fined or penalised, a legal service such as GC Traffic Lawyers may be able to help fight the charges against you. Failing to give right of way at intersections is one of the most common causes of road collision. This makes it important motorists approach all intersections with caution and take the time to consider who has right of way before proceeding.